In 1972, Bo opened what would one of the largest African-American owned junkyards in the Southeastern United States, Gibbs Brothers Salvage, with his brothers Charles and Kenny. 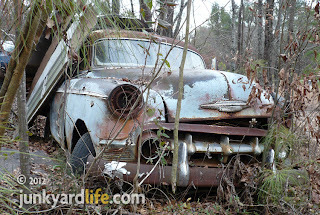 Entance to Gibbs Salvage in Ridgeville, Alabama. 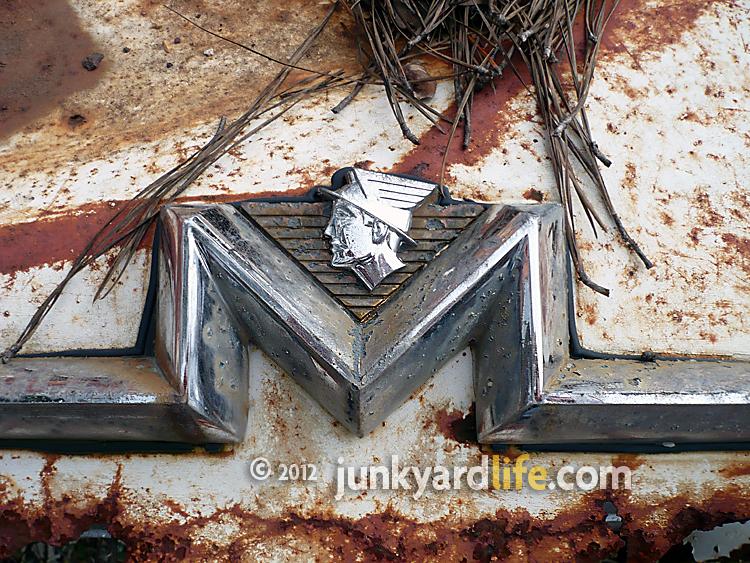 1958 Mercury Medalist has been at Gibbs Salvage for years. In 1986, Bo changed the name to Gibbs Salvage when his children were old enough to work at the yard. Bo's daughter, Raquel, and four sons, Kevin, Rodney, Jamie and Alan have all worked at the yard throughout the years. Bo continued to build the salvage yard near Attalla into a successful, family business while holding down a job at Gulf State Steel. Bo continued to work at the salvage yard until he passed away on January 2, 2007. 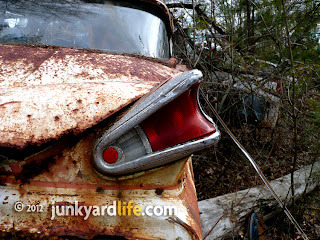 Bring your hiking shoes and a lunch if your going to Gibbs Salvage in Alabama. Bo Gibbs’ family struggles to keep their father’s legacy alive. 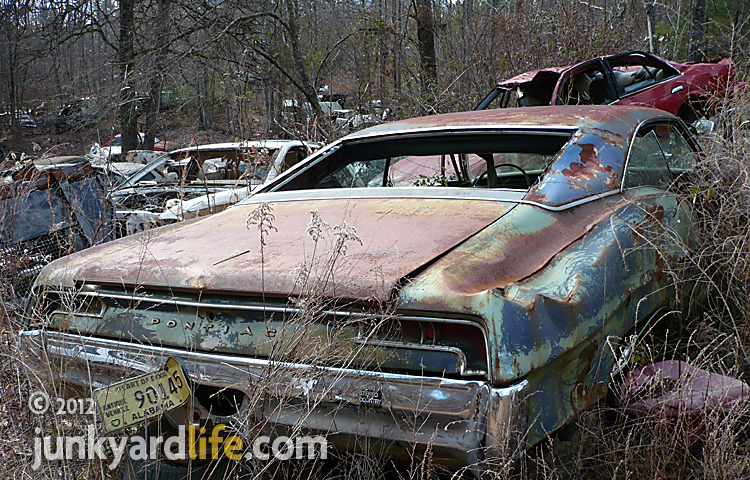 Health issues and money woes make operating the large salvage yard almost impossible without Bo's expertise. A recent run-in with a rogue, scrap dealer did not help matters. 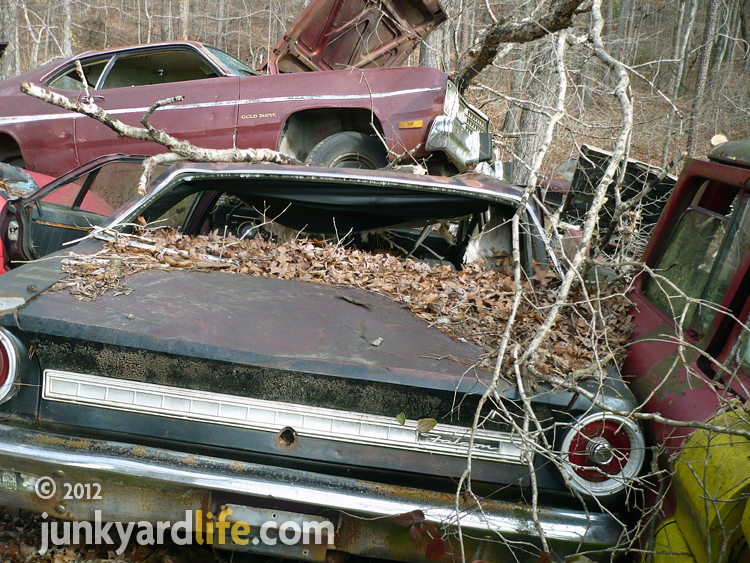 The scrapper brought a mobile car crusher onto the Gibbs' property. 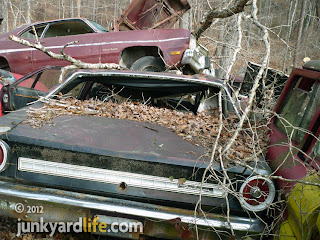 Dozens of cars were crushed and hauled away and sold for scrap but the Gibbs’ were not paid their part of the money. 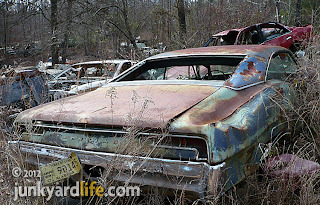 Losing cars is like losing money and there is not enough to go around. Their advertising budget is nonexistent. Most customers find the place by word of mouth. Gibbs' hard-earned reputation may be their saving grace. 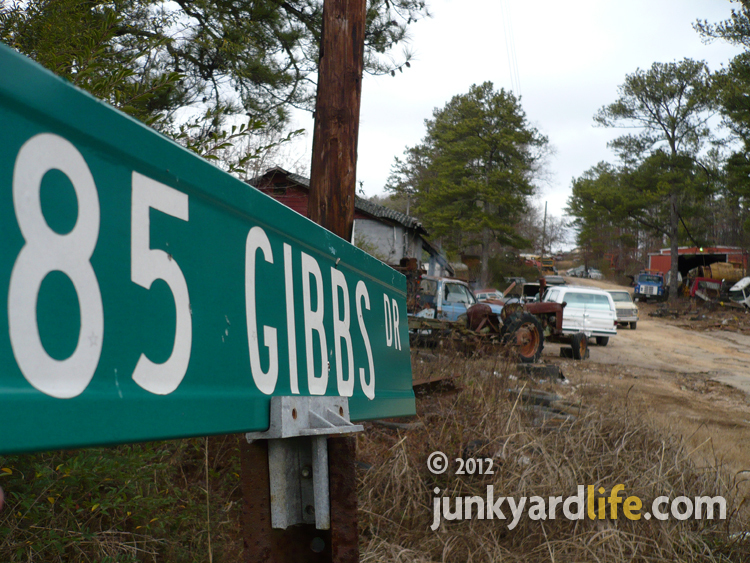 Bo Gibbs’ place is known all across the South as a good place to find older, hard-to-find parts. Who: Gibbs Salvage in Ridgeville, Alabama. Located near Attalla in Northeast Alabama. 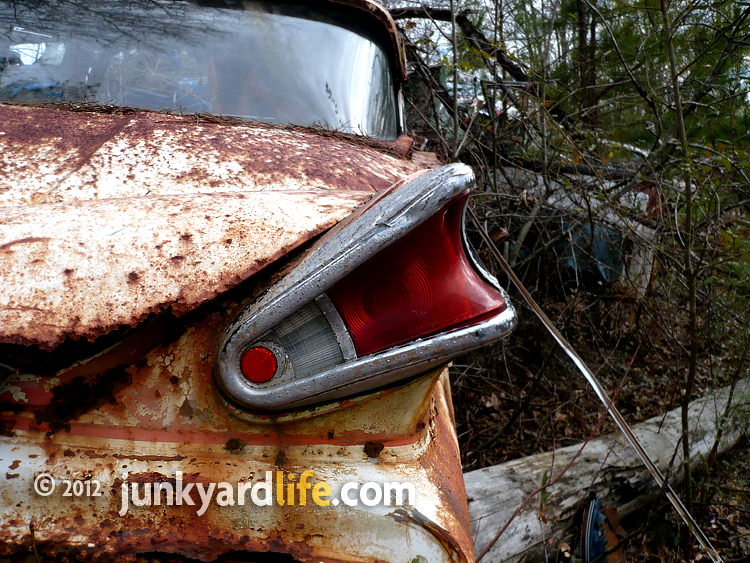 What: A junkyard started by James “Bo” Gibbs after he returned from service in the Vietnam War. Gibbs Salvage is 75-acres of junkyard treasure. Located off Highway 431 turn East on Duck Springs Rd. Turn Left onto Gibbs Drive. A small trailer serves as the office. It is located on the right as you make your way along Gibbs Drive. Hours: Monday - Friday 9 a.m. to 4:30 p.m.; Saturday 9 a.m. - 2:30 p.m.
1972 Plymouth Gold Duster sits on top of a 1967 Ford Falcon. What I saw: I scanned the jagged hillside and rut-filled, red clay roads that meander throughout 75 acres of land at Gibbs Salvage in northeast Alabama. 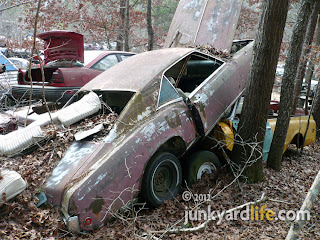 My goal on a cool, damp February day was to find some usable seats for my junkyard dog 1980 Trans Am. I stopped by the office, located in a small trailer, and asked for a general direction to start searching for 1970s Firebirds and Camaros. “Have a look around,” said Kevin Gibbs. Most yards with older inventory are not as friendly and open to customers picking their own parts. Ask one of the employees at Gibbs what your looking for and a price. There is a chance they might now where to look. Once you find the part, you pay on your way out. Kevin mentioned that the yard has a few cameras stationed around the unfenced property to deter theft. 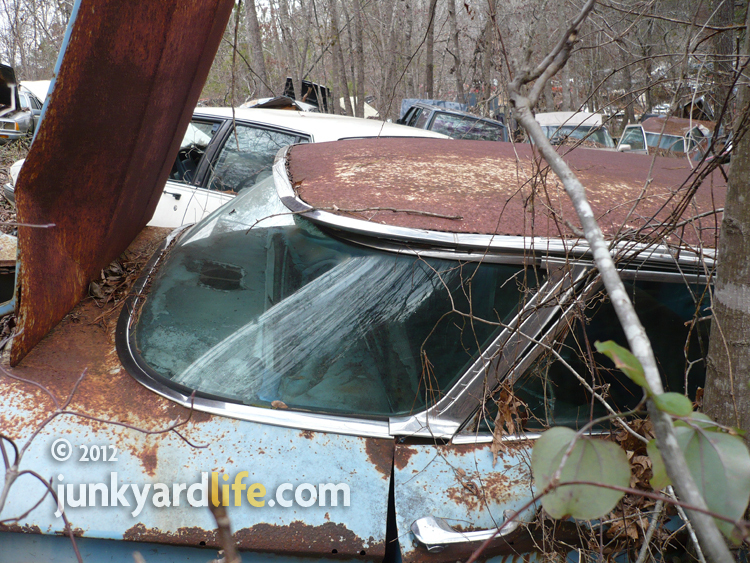 The hunt: My adventure began as I hiked, climbed and crawled around a large portion of the yard with junkyardlifers Ron Kidd and Anthony Powell. We didn’t have any luck on the seats for my car. Anthony spotted a couple of interesting late 1960s and early 1970s Buick Rivieras. 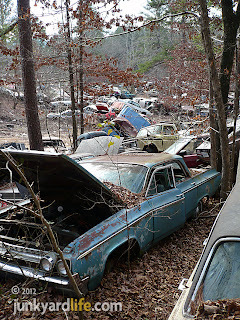 Difficult driving: It must have been 6 or 7 years ago when I made my first trip to Bo Gibbs Salvage yard in northeast Alabama. 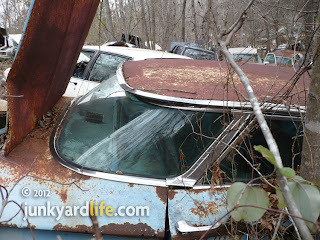 Even then, when Bo was alive, the salvage yard was a challenge to navigate. The hilly, dirt roads have deteriorated and overall the place is a shadow of its former self. 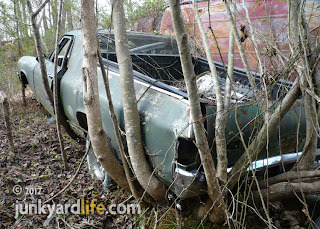 New inventory is nonexistent and many of the older cars have been damaged as they’ve been moved about the yard. What to take if you go: If your not in shape to climb the hills, a four-wheel drive truck would be best. Tools, possibly a machete may be needed to cut away brush. Patience. 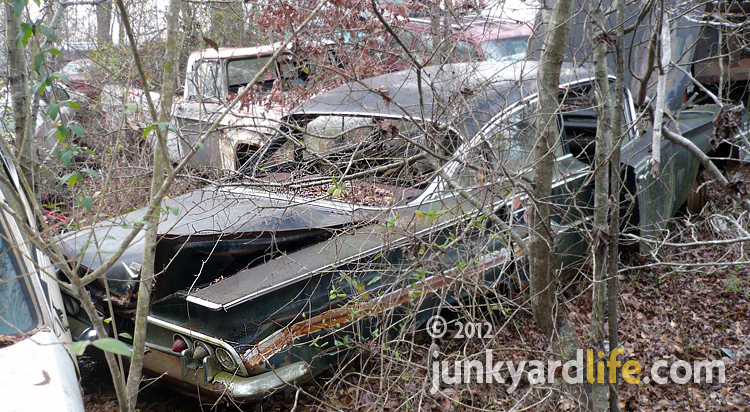 Cars are scattered across the land in no particular order. 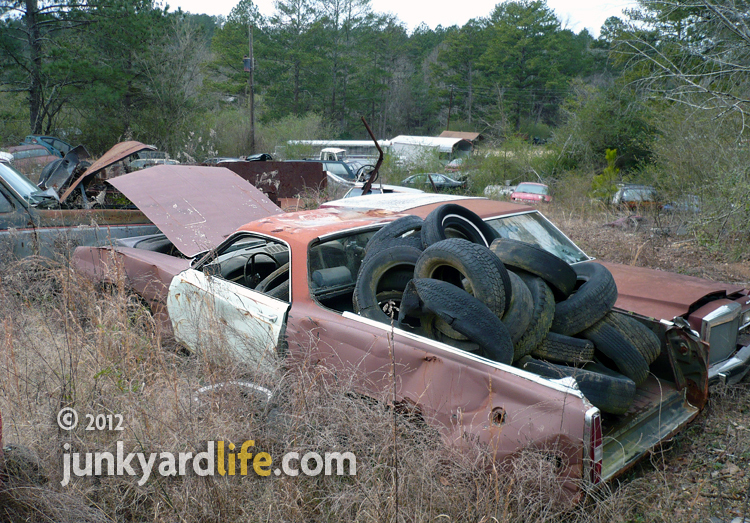 You will have to search the yard for what you are looking for. This may take a large chunk of your day. Cars stacked like this 1969 Buick Riviera are not uncommon at Gibbs. Careful out there: There are some good parts waiting for the right buyer to find them. The trick is finding what your looking for. It could be under a stack of cars 2 or 3 deep or buried in a hillside. It won’t be an easy picking day. 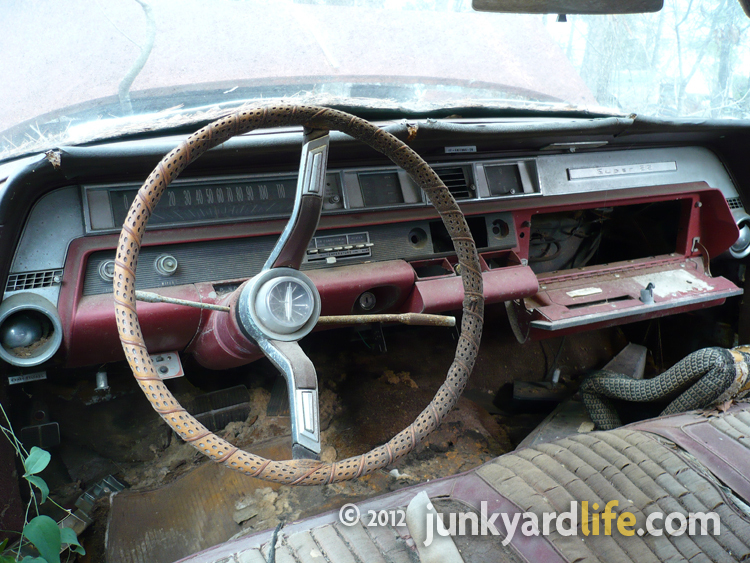 1963 Olds Super 88 interior is mostly complete. Note the a/c vents on dash. 1967 Ford Ranchero. Looks tired. 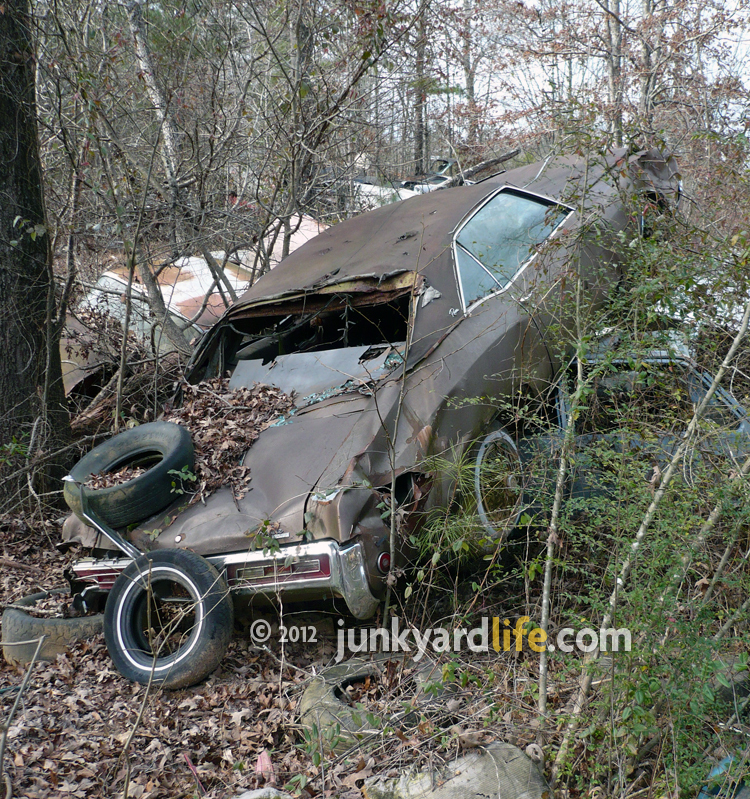 1970-1972 Chevy El Camino parts are mashed between trees and the roof of a van. Beefy ’58 Mercury emblem found at Gibbs Salvage. In 1960 GM stylists designed a wrap-around rear window for many of their full-size cars. 1953 Chevy was customized into a camper. The black Falcon pictured can't be older than a '67. Thank You! Thanks for the info, I need to polish my blue oval skills a bit - correction on the way! Is this place all Detroit iron or is there some furrin in the mix? I saw a couple of roached VW buses in the mix. Funny that none of the foreign cars stick out in my mind - gotta work on that - there were dozens of them though, among the Detroit iron. Hmmm, I might have to assemble some fellow car nuts and make a trek up there. Seems like there might be a little something for everyone. 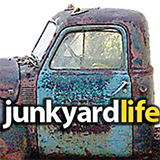 Saw the junkyard on your site. Had to go. Awesome place, we were in heaven. Plenty of Impalas and galaxies. Do u have any mustang 67?